In a study of postmenopausal women, participants who lost weight had a lower risk of developing invasive breast cancer than those who maintained or gained weight. Published early online in CANCER, a peer-reviewed journal of the American Cancer Society, the findings suggest that weight loss may help lower postmenopausal women's breast cancer risk. Although obesity has been strongly related to breast cancer risk, studies examining whether weight loss might reduce postmenopausal women's risk have provided mixed results. 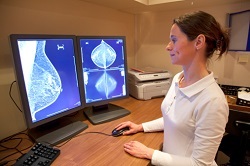 To examine the issue, Rowan Chlebowski, of the City of Hope National Medical Center in Duarte, California, and his colleagues analysed information on 61,335 women participating in the World Health Initiative Observational Study who had no prior breast cancer and had normal mammogram results. The women's body weight, height, and body mass index were assessed at the start of the study and again three years later. During an average follow-up of 11.4 years, there were 3,061 new cases of invasive breast cancer diagnosed. Women with a weight loss of 5% had a 12% lower breast cancer risk compared with stable weight women, with no interaction by body mass index. Weight gain of ≥5% was not associated with risk of breast cancer overall but was associated with a 54% higher incidence of triple negative breast cancer. "Our study indicates that moderate, relatively short-term weight reduction was associated with a statistically significant reduction in breast cancer risk for postmenopausal women," said Dr Chlebowski. "These are observational results, but they are also supported by randomized clinical trial evidence from the Women's Health Initiative Dietary Modification trial where, in a randomized clinical trial setting, adopting a low-fat dietary pattern that was associated with a similar magnitude of weight loss resulted in a significant improvement in breast cancer overall survival. These findings, taken together, provide strong correlative evidence that a modest weight loss program can impact breast cancer."